Winter’s Seville oranges season is over so this is for next winter’s marmalade (by which time the world will no longer be possessed by divide-and-rule politics and the UK has reversed extreme poverty described by the UN Special Rapporteur). This ratio of oranges to sugar works well. Not too sweet. Excellent jelly-like consistency. A keeper. 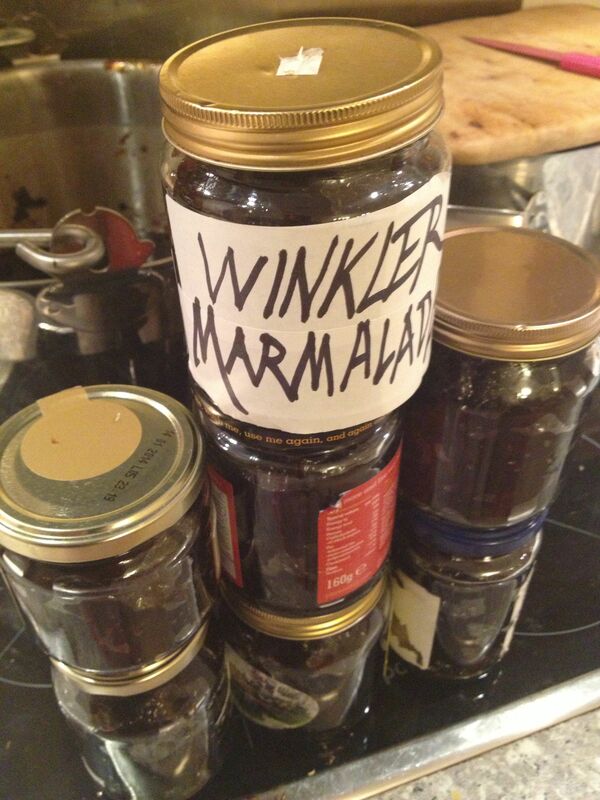 My trusted slightly-edited marmalade recipe, which I owe to the late Katie Stewart, the Times cookery writer, is below. Beg or borrow a preserving pan. * Otherwise, use a pan that is deep enough for the marmalade to boil safely and wide enough to give a large surface of evaporation. Clean jars thoroughly with hot water and dry them in oven. 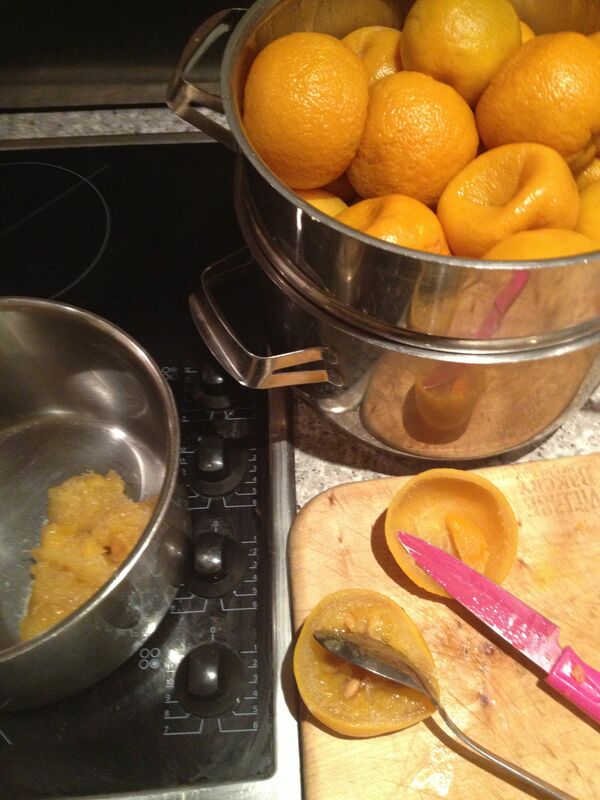 Drain cooked oranges and reserve cooking water – a precious liquid that becomes marmalade. So far, this process can be done earlier, or the day before. Pectin, extracted from the insides of the fruit, is the setting agent. Cut cooked-and-cooled oranges in half. Add pith-and-pips to a large-enough pan with the additional 1 pint of water and 2 lemons cut in half. Simmer for ten minutes then drain and reserve. 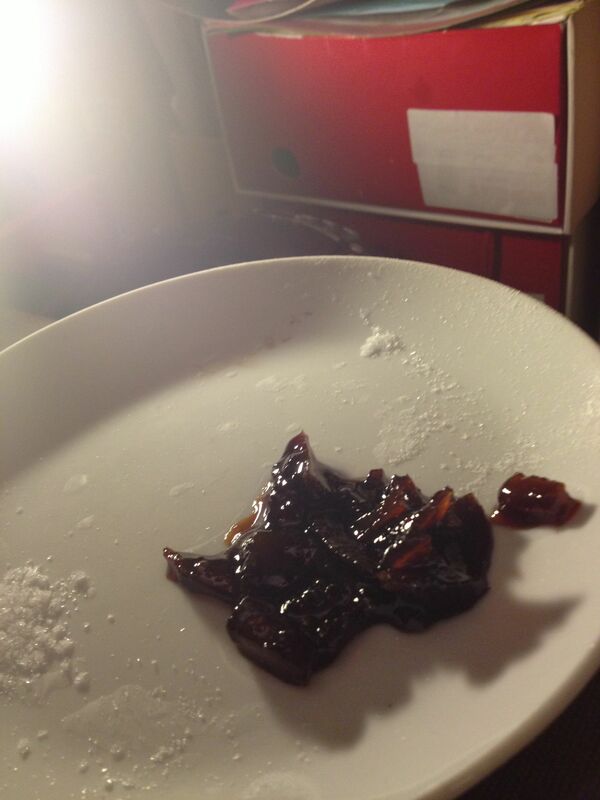 This pectin-rich liquid will be used in Stage 4. Flatten softened peel, and cut up peel of oranges (and the 2 lemons) with a small sharp knife as thinly/thickly as you like. Add the precious orange water (Stage 1), drained pectin-juice (Stage 2), and cut-up peel (Stage 3) in with sugar into preserving pan. It takes about 20-30 minutes to get the whole pan boiling and it is after that, you must watch like a hawk for the (ta-da) rolling boil. Overboiling at this stage can stop the marmalade setting. So timing the rolling boil is important. After 15 minutes of a rolling boil, take the pan off the heat. A rolling boil is when the marmalade is not just bubbling but is a fast-boiling glucky furious whirl. Let droplet cool, tilting plate to encourage cooling, then push droplet gently with your finger. You are looking for tell-tale wrinkles and jelly-like character. (The opposite to the lead in a romantic movie). If the droplet is runny, boil again for a few minutes then test again. And so on until the test droplets are unequivocally set. Let jam cool in pan until not-too-hot yet not too-set for pouring. Next, is the sticky bit so spread newspaper over kitchen surfaces, and use a ladle or a jug to pour the warm marmalade carefully into clean jars. Recipes often say use waxed discs to keep out condensation and mould but, cutting-corners-cook that I am, I have not done so for years, with no adverse effects. Wipe jars from stickiness and proudly label. The cookery writer, Katie Stewart, died earlier this month. There was an outpouring on Twitter from those including me who had learned to cook from her cookbooks. Then Guardian food and wine writer, Fiona Beckett, suggested a Katie Cook (#katiestewart) day and others on Twitter took up the call, followed by Alex Renton in The Times. This is my contribution. I have been following Katie Stewart’s helpful, practical recipe for making chunky marmalade since 1980 from The Times Calendar Cookbook. Having decreased sugar bit by bit, I now use less sugar than fruit. 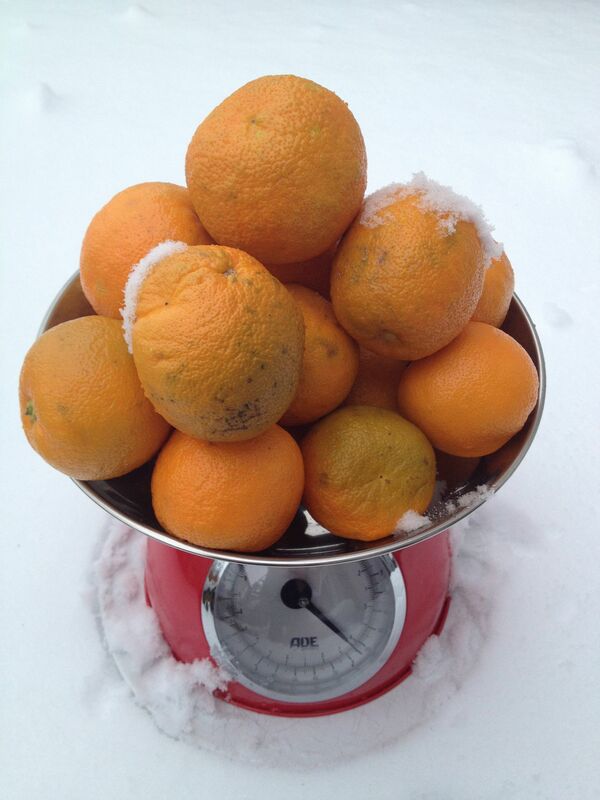 Katie’s original amounts: 3 lbs/ 1.1/4 kg Seville oranges | 6lbs / 2.3/4 kg sugar | 5 pts/ 2.3/4 litres water | juice of 2 lemons. By paying the extra, I am doing my bit for healthier soils and water, and feeding the world. Think of it as a charity donation. Talking of which, Katie Stewart’s family has asked for donations (rather than flowers) for The Kids’ Cookery School. The charity’s mission is to give every child in the UK an unique fun cooking experience to help them make informed choices about food. You can donate online. My marmalade 2001 blog post talks about the young US soldier, Bradley Manning, Wikileaks whistleblower. Currently in pre-trial court martial proceedings, on Thursday he was refused the whistleblower’s defence: motive. The marmalade: Katie Stewart’s recipe for Chunky Seville Marmalade, her invaluable tips, my amounts and spin on my Marmalade 2011. Apologies not metric – any help with converting amounts welcome. Add lemons at preserving pan stage. 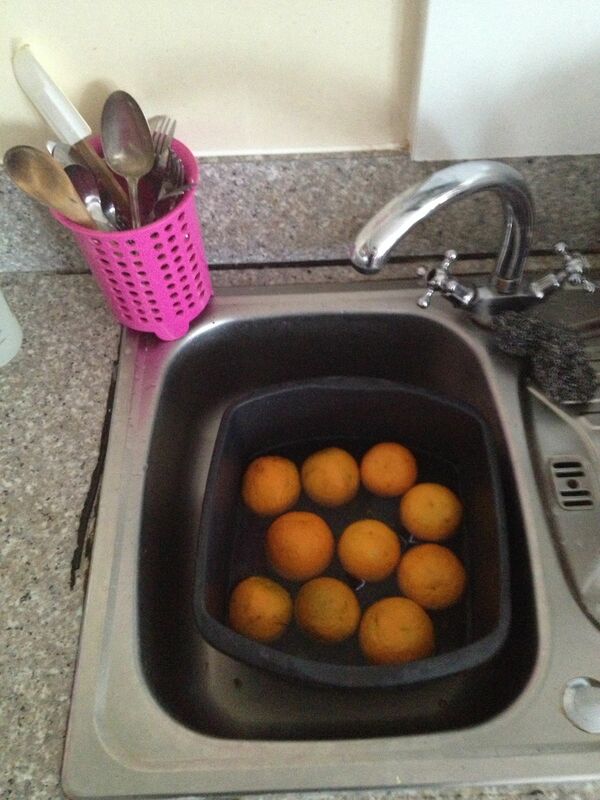 Drain cooked whole oranges and preserve cooking water as if it were a precious liquid (it is). This process can be done earlier, or even the day before. Pectin, extracted from the insides of the fruit, is the setting agent. Cut cooked-and-cooled oranges in half. Scoop out with spoon the oranges’ insides – the pith and pips (pith and pips pith and pips – say it quickly) . Add pith and pips to large pan with the 1 extra pint of water. Simmer for ten minutes then drain: this pectin-rich liquid will help jam set in Stage 4. 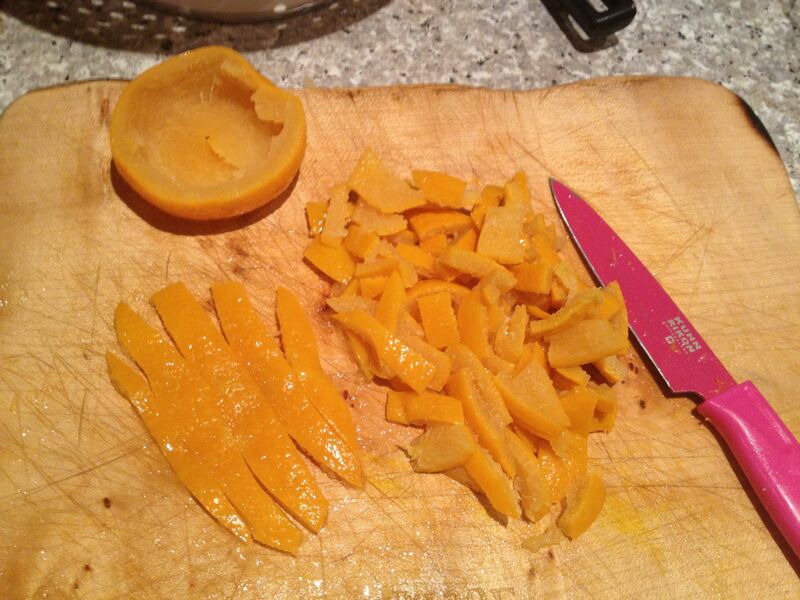 Flatten softened peel with your hand, and cut up peel of oranges (and lemons), thinly or thickly, as you like. Add the sugar (warmed from the oven) to a preserving pan. Strongly suggest a preserving pan is good investment – otherwise use two of your widest pans. You must not overboil or you can lose that magic-setting moment. It really is as terrifying as it sounds. But you know what they say: the other side of fear is excitement. It takes about 20-30 minutes to get it to boiling temperature and then you have to watch it like a hawk. 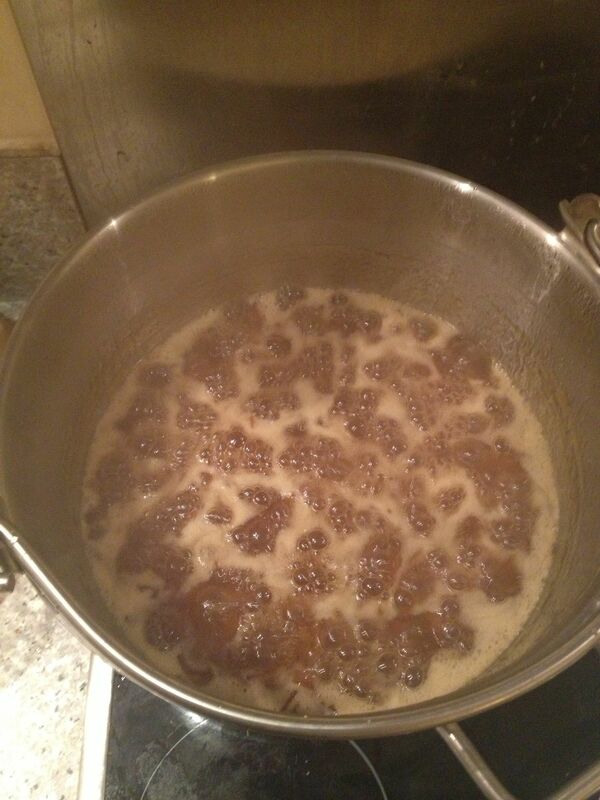 Start timing your 15-20 minutes when the jam is boiling like mad i.e. not just bubbling but when liquid goes into a furious fast-boiling glucky whirl – then start timing those 15-20 minutes. So, after 15 minutes, take the pan off the heat and drop some hot jam on one of those icy-cold plates. Let jam-droplet cool, tilting plate to encourage cooling, then push droplet gently with your finger. You are looking for tell-tale wrinkles and jelly-like character. (The opposite of an ideal lover? My 2011 joke). If droplet is still runny, carry on boiling the big pan for a few minutes then test again. And so on. The marmalade droplets are now unequivocally set. Let jam cool in pan until not-too-hot nor too-set for pouring . Next, the sticky bit. Use newspaper to cover kitchen surface, use a ladle or a small cup. Good luck. Recipes say use waxed discs to keep out condensation and mould but, cutting-corners-cook that I am, I have not not done so for years, with no adverse effects. Wipe jars from stickiness and proudly label.